A common practice in the sales industry and unfortunately the martial arts industry is that of “puffery,” where a seller makes exaggerated claims as to the degree of quality or other attributes of their products or services. Unlike puffery, a seller's use of a registered trademark (a verifiable fact) in advertising and promotion without a license from the registered trademark owner constitutes trademark infringement and/or may include trademark counterfeiting and both are subject to civil and/or criminal prosecution and penalties up to and including felony criminal charges. To help separate facts from puffery in the claims made by a martial art school owner (as you will be required to do when legally proving fraud), it is prudent to perform a bit of due diligence with regard to the names of martial art entities published by, or mentioned by, the martial art school owner, martial art instructor or their staff during their initial representations to you. 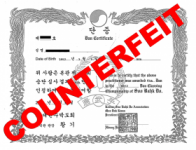 A martial art school owner may claim to be recognized by, or a member of, or associate of, a larger national or international martial art entity with an impressive sounding name or long history, etc. and your due diligence might include determining if a named, or claimed, martial art entity is legitimate and whether or not is has a substantial and verifiable structure, history, number of members or affiliations, etc.. Some individual martial art schools may have more members than some entities proclaiming they are national or international organizations, associations, federations, etc. Your goal is to distinguish legitimate, larger martial art entities from individuals or very small groups who may have adopted very large sounding names as part of their puffery and to understand how those entities are being represented as fitting into the chain of services and credentials that you will be receiving at the martial art school. After all, would you want to enroll at HAVRAD University thinking you were enrolling at HARVARD and after four or more years of study, exams and tuition you receive your diploma and then discover it is a counterfeit and your studies and grades are not recognized by potential employers or other educational institutions? It is recommend that you write down the martial art organization or entity names stated to you as some may be long and contain foreign words. Or you may choose to simply take photos with your camera or camera phone of the signs, certificates, etc. that they show you during their presentation and then you can refer to those later to avoid spelling errors during your due diligence research.You will also have collected facts (required in a fraud lawsuit) about what was stated and/or represented to you as an inducement to enroll. Should a martial art school owner, instructor or staff member object to you taking photos, this could be a red flag warranting additional consideration as legitimate schools and instructors will be displaying legitimate items and it is unlikely photographs will be discouraged or prohibited. However, if trademark infringement or trademark counterfeiting is present, then by prohibiting you from taking photos you will be prevented from gathering factual evidence of those illegal activities. The goal of your due diligence on this point about martial art entity names is to determine if the entity names stated by a school owner, instructor or staff member fall into any of the following classifications or others. For your due diligence, you might choose to use a business intelligence service or a background checking service or simply perform some research on your own in order to determine if a particular entity named as, or claiming to be, a national, world, international, global, etc. martial art association, organization, federation, etc. is reasonably so. Either way, you will be better informed to make your decision afterwards. There are many well established and reputable martial art schools and/or sizable martial art organizations to choose from and with a bit of due diligence you can pick good ones and be free from deception and/or a disappointing or fraudulent experience. 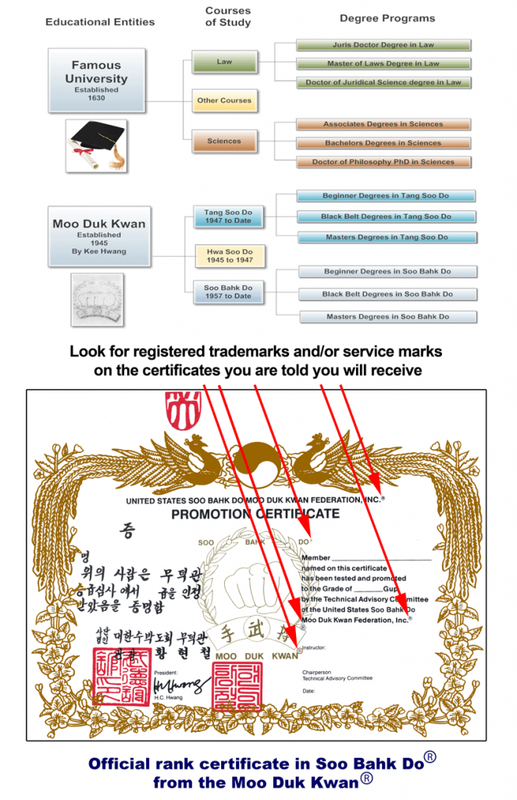 For example a bit of due diligence on, The U.S. Soo Bahk Do Moo Duk Kwan Federation reveals that it is a 501(c)(4) non-profit corporation chartered in the state of New Jersey in 1976 and that it has been in continuous operation since its inception.